Zion National Park is much larger than it feels if you stick to the main drive. 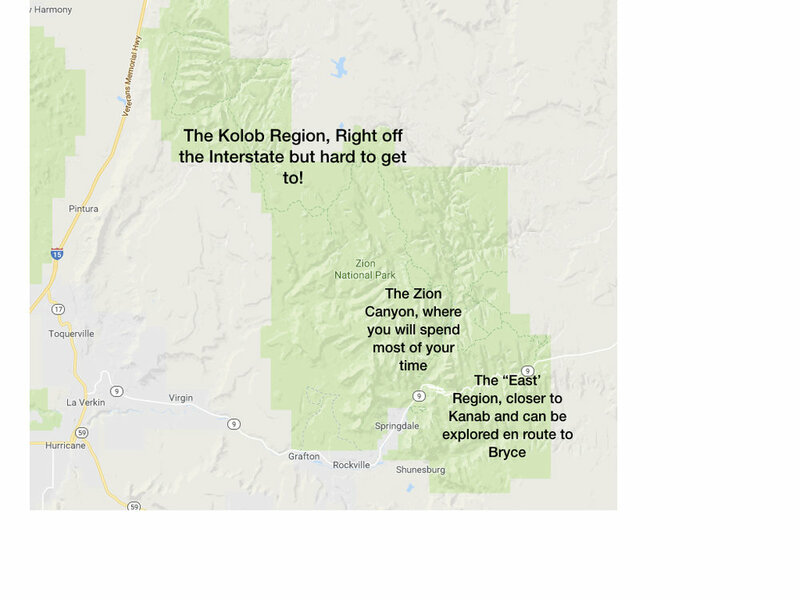 There are three sections: The main road through Zion canyon, the Kolob canyon region, and what I'll call the 'east' region. The area around the park is quite unpopulated so finding a place to stay can be tricky. Many people are lured in by the idea of St. George (a golfing area with outlet malls and other touristy attractions) and Kanab (a small town to the east of Zion). Kanab is sort of between Zion, Bryce, and the Grand Canyon. You can get to the main attractions of all three parks in about 2 hours. But ~4 hours of driving daily is TOUGH. The Coral Pink Sand Dunes State Park is pretty close to Kanab and would offer a good option for a day trip from there without as much driving. If you look at the map above, you'll notice that neither St. George nor Kanab are even on the map. In our opinion, there are only three good options: 1) Camp in Zion, 2) Reserve a spot at the lodge in Zion, or 3) Stay in Springdale, Utah. Camping requires equipment and planning. Staying at the lodge requires $$$ and even better planning. So if you're like us, Springdale sounds pretty good. It's a small town but it's right at the base of the park. During busy months, the shuttle that runs visitors through the main canyon also makes stops in town so you don't even have to worry about parking. There are plenty of cute hotels and motels in Springdale and lots of good places to eat (our favorite was MeMe's Cafe). Springdale even offers some National chains for hotels if you want to earn or redeem rewards points. We've only stayed in Zion once but really, really enjoyed our clean one bedroom rental through Homeaway. This was NOT a cheap rental but it was really in remarkable condition. It'd be easy to manage a small family using the pull-out couch. Or if you and some spend-thrift friends could decide who got the comfy bed vs. the couch, that would work, too. Next time we go to Zion, we're likely to try to get this rental again despite the price because it was just so nice. Feel free to peruse other rentals through Homeaway but be critical of their location. An extra 20-30 minutes each way to the park really adds up each way, and especially if you're taking breaks to go home for lunch or naptime, you want that drive to be short. ***This is not a sponsored post, just our opinion about where to stay. If you own a home rental in Springdale or near any other National Park and would like us to review it, please feel free to Contact Us and we can discuss options.